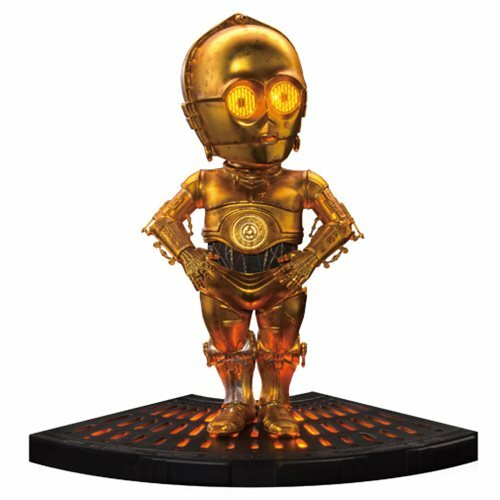 Beast Kingdom Toys is proud to present the Egg Attack Star Wars series EA-016 Star Wars C-3PO statue! This collectible statue is constructed with compound material and painted with expert technique, perfectly representing C-3PO's gold armor, silver right leg, and the weathering effects from time spent stranded on the desert planet of Tatooine. It has built-in classical lines officially licensed by LucasFilm, which 100% matches with the movie setting. The statue comes with a classic Carbon-Freezing Chamber light up figure stand, for collectors to customize their display. Measures 6-inches tall. "And I am C-3PO, human-cyborg relations and this is my counterpart, R2-D2." "At last! Where have you been?" "I do believe they think I am some sort of God." C-3PO requires 2x LR44 batteries and the base requires 2x CR2032 batteries. Ages 15 and up.